PDT File Photo Ohio Gov. 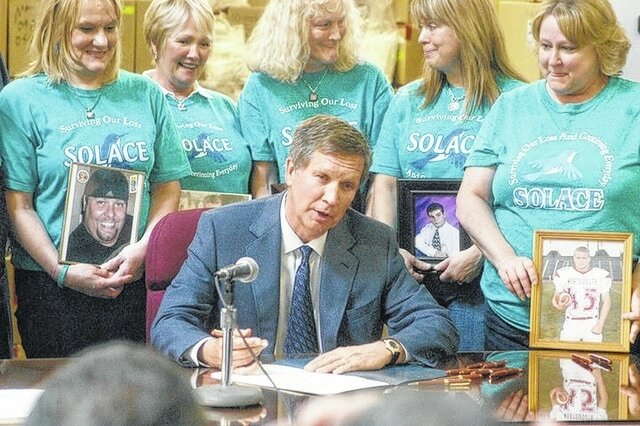 John Kasich is seen signing House Bill 93 into law surrounded by members of SOLACE from Scioto County in 2011. Ohio Governor John Kasich on Tuesday became the 16th person seeking the Republican nomination for President of the United States of America. Kasich made his announcement on the campus of The Ohio State University. Local politicians have mixed responses to Kasich’s candidacy. The Scioto County Commissioners are taking a wait-and-see approach when it comes to Kasich’s bid for president. All three commissioners are members of the Scioto County Republican Party. “They could do a lot worse than Governor Kasich. On the other hand when you look at the shape the county is in, someone as radical as Donald Trump would probably make his mark on history,” Chairman of the Scioto County Commissioners Mike Crabtree said. Commissioners Crabtree and Doug Coleman agreed that Ohio is in a lot better shape financial shape than it used to be. “(Some of his decisions) have not been very pleasing to some people, but on the other hand it never is when you’re trying to do more with less,” Crabtree said. Commissioner Bryan Davis said Kasich has stuck to his word and his promises. “We’ll have to wait and see what he has to offer. There are a lot of people running for president. I do like the fact that he’s from Ohio, but we’ll wait and see,” Davis said. This, through budget cutting, privatization of parts of Ohio’s government and other, often business-style innovations. The commissioners acknowledged the Kasich Administration has done some good for the area; with the increased awareness and focus on prescription drugs and pain clinics. Many from the area praised Kasich when House Bill 93 was signed into law. State Representative Dr. Terry Johnson helped to craft the legislation. The commissioners also acknowledged the start of the Southern Ohio Veterans Memorial Highway under the Kasich administration. It’s been reported that once all costs are factored into construction and long term maintenance of the Southern Ohio Veterans Memorial Highway (Portsmouth Bypass) the roadway will cost the state $1.2 billion. “He’s delivered on a lot of fronts and it would be nice if that success could be taken to the rest of the country,” Davis said. Kasich’s entry nearly rounds out an unusually diverse Republican lineup with two Hispanics, an African-American, one woman and several younger candidates alongside older white men. So many are running that it’s unclear Kasich will qualify for the GOP’s first debate in his home state in just two weeks. Wayne Allen can be reached at 740-353-3101, ext. 1933 or on Twitter @WayneallenPDT. The Associated Press contributed to this story.